If I look a little bit aloof, it's because I'm a very proud dog. Supposedly, my ancestors were aboard Noah's Ark! Because I am basically a hound dog with hunting instincts, I sort of like to do my own thing. I'll still fit in well with your family as long as you don't expect me to bring your slippers or get the newspaper. My coat is silky and beautiful, but it requires quite a bit of effort to keep it that way. Bathing, drying and brushing me is like grooming three little bitty dogs, but it is worth it to see the results. I also need regular exercise in order to stay healthy and fit. When fully grown, I am between 25 and 27 inches tall (63.5 to 68.6 centimeters) and I weigh between 50 and 60 pounds (22.5 to 27 kilograms). We have no Afghan Hound Breeders listed at this time. 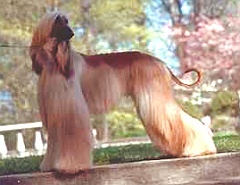 Click here to place your Afghan Hound Ad!